It’s nice to know that fortunes can change quickly and for the better. However, dealing with a financial windfall can bring a new set of financial issues that you haven’t encountered before and you might find to be unexpectedly challenging. The baby-boomer generation (ages 47 to 65) is poised to inherit substantial funds from the “greatest generation” of elders, who may have benefited from funded pension plans, frugality, and lifelong savings habits. As family holdings change hands, people can be thrown into confusion and conflict. However, advanced planning can ease this transition, provide long-term stability, and eventually calm the storms of emotions. For some, the onset of sudden wealth comes with emotional upheaval. This is common because a substantial inheritance may come from the loss of a beloved family member or close friend. But intense or sad emotions mixed with money isn’t a sound equation and can result in impulsive decisions carrying less-than-ideal long-term consequences. Stop and Breathe. Many people will want to give you advice, most well intended, some self-serving. Therefore, you may want to speak with a financial advisor who can provide you with objective recommendations. Choose a financial advisor in the same way you choose other critically important professionals, by thoroughly reviewing qualifications and by looking for a good match with your values and priorities. Financial advisors come today with varying credentials, experience and expertise. Learn how to judge the qualifications of financial advisors. It's a good idea to interview a few before making a final decision. Ask each how s/he would approach working with you. Listen to your intuition and find someone that you feel listens to you and understands your needs and goals. Give yourself permission to succeed. If managing wealth is a new task to you, you might feel intimidated or even guilty for having money. Emotional barriers may be making it more difficult to make wise decisions. Your net-worth and self-esteem are now entangled. But trust yourself to be responsible and remember to take the long view. Therapists have even coined a term for your situation: "Sudden Wealth Syndrome" – its "symptoms include: feeling isolated from former friends, feelings of guilt over their good fortune, and an extreme fear of losing all their money." (source: http://www.investopedia.com/terms/s/suddenwealthsyndrome.asp#ixzz1eTk0GwkP) Remember that you haven’t changed, just your finances have. Avoid financial pitfalls. Financial documents can be intimidating. They can create an anxiety that's similar to math anxiety. Don't hesitate to ask questions or to admit you don't understand everything. Few people without specialized training can understand all the documents you will see when considering your investment options. Don't sign any paperwork you don't understand. Make sure the financial advisor you choose is willing to take time to answer your questions. Take inventory. Before you can set new goals and make long-term decisions, you need to gather your information. What do you own? What is it worth? Are there tax implications associated with this wealth? How much debt do you have? Identify your real estate holdings, cash, bank accounts, stocks and bonds, retirement funds, insurance proceeds, automobiles, art, antiques, and collections. This process can take months, so give yourself time to fully gather all of this important information. It will ultimately help you make better-informed decisions. Set your financial goals. What does wealth mean to you? In the 2002 article The Financial Psychology of Four Life Changing Events, published in the Journal of Financial Planning, William L. Anthes, PhD and Shelly A. Lee wrote "Money not only is a medium of exchange, it is also a substitute for love, a symbol of power, a benchmark of success, a tool for doing good deeds, a source of great anxiety, a scapegoat, a flashpoint in a marriage, and an emotional force of its own." Pretty heavy stuff indeed. Preparing and sticking with a well-managed financial plan can provide freedom from these intense emotions, such as anxiety and fear. This is where your advisor can help indentify your risk tolerance, guide you on appropriate levels of debt, help you prepare for retirement, set up charitable contributions, and direct you to a tax specialist. 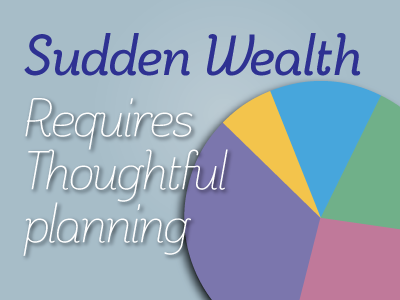 Good advice and solid planning can take the anxiety out of managing wealth for you and let you enjoy the benefits. Heidi Clute, CFP® of Clute Wealth Management in South Burlington, VT and Plattsburgh, NY, an independent firm and registered investment advisor that provides strategic financial and investment planning for individuals and small businesses in the Champlain Valley region of New York and Vermont. Clute Wealth Management and LPL are separate entities. The opinions voiced in this material are for general information only and not intended to provide specific advice or recommendations.